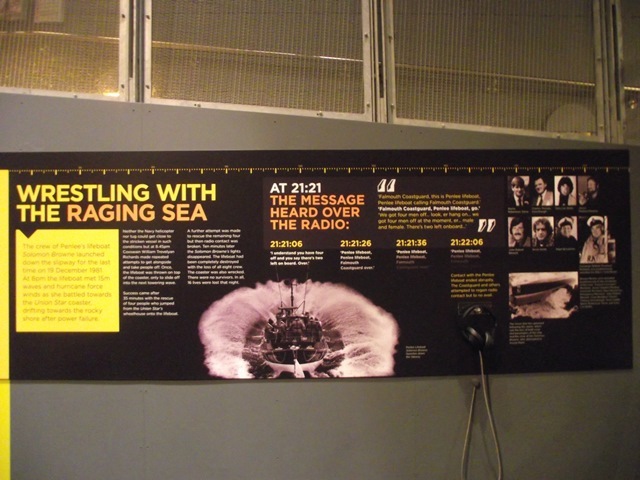 B2B copywriters can learn a lot about storytelling from these superb multimedia displays. When was the last time you found a museum exhibition so affecting it brought you to tears? It hadn’t happened to me before, and I hadn’t been expecting it to happen at the National Maritime Museum Cornwall, which I’d always imagined was just full of old boats. I was wrong. 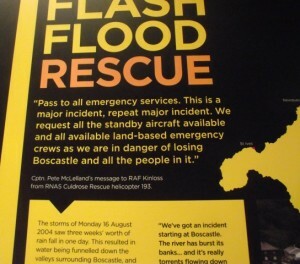 The museum is currently running a superb exhibition on the theme of search and rescue. (If you’re in Falmouth, it’s well worth a visit.) On my first visit, I found myself transfixed by two displays in particular; one about the flooding of Boscastle in 2004, and one about the loss of the Penlee lifeboat Solomon Browne and its crew in 1981. 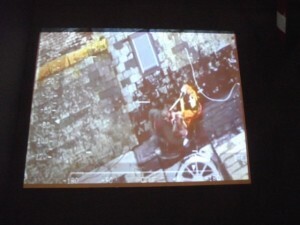 What struck me was the way the curators have used multimedia techniques to tell these deeply affecting stories in a powerful yet extraordinarily economical fashion. 1. Pull your audience straight into the action. The Boscastle display consists of a single board of text accompanied by large-screen looped video footage of the rescue operation and spliced-together audio clips from the day of the flood. You’re immediately drawn to the video, which has no start or end but simply places you alongside the helicopter rescue team, looking down on the floodwater engulfing the town and at people desperately awaiting rescue. Instantly, you’re not watching a story so much as taking part in it. The in medias res technique continues in the accompanying text, which dispenses with any scene-setting preamble and instead starts with a verbatim quote from an emergency call to RAF Kinloss in Scotland from RNAS Culdrose in Cornwall. You’re in no doubt that the story is about a major emergency on a national scale – the description comes later. Every museum display has to compete for attention with the other displays nearby. And in a child-friendly museum like the NMMC, parents visiting with young children don’t have long to stand and look at each one. (B2B copywriters will be more than familiar with the need to get attention quickly and get the point across before the audience is distracted by something else.) 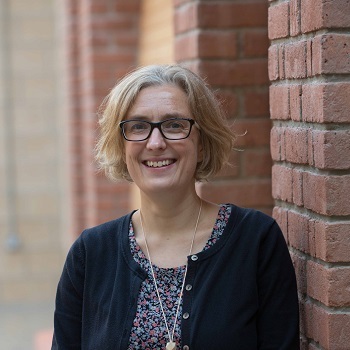 Economical storytelling is the answer: using words, design and audio-visual features to capture attention and get information across as quickly, effectively and engagingly as possible. 3. Combine descriptive text with infographical elements. 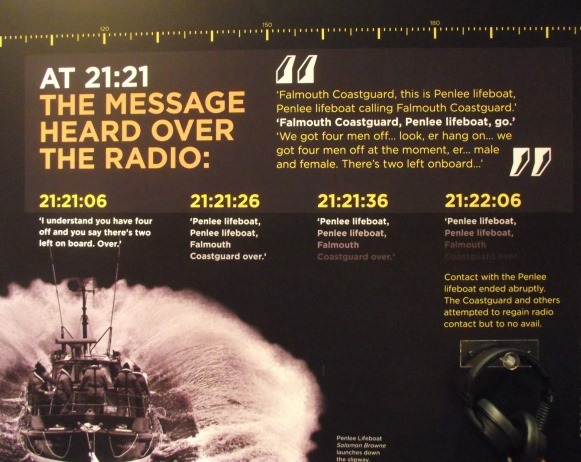 The designers have used numbers, quotes, timestamps and photographs to tell the story of the loss of Penlee lifeboat in just three panels (think of each panel as a spread in an ebook). 4. Let copy and design work together for maximum impact. Text, images, graphic and audio elements don’t just combine to tell the story – they amplify each other. Strong colours, contemporary photographs and eye-catching graphics instil a sense of drama and danger, while timestamps emphasise how quickly the action unfolded. The fading font colours on the coastguard radio transcript powerfully convey the loss of life and hope. The ‘ers’ in the transcript, combined with photographs of the lifeboatmen who lost their lives, highlight the human tragedy. The designer and copywriter must have worked very closely together to make it work. 5. Use an appropriate style. As B2B copywriters, we don’t often have the opportunity to write for beautifully-designed multimedia installations, and our subject matter is rarely as dramatic as this. But as design starts to play an increasingly important role in the work we do, it’s really interesting to look at how other sectors use copy and design together to capture an audience’s attention, maintain it for the duration of the story, and ensure the story remains memorable for a long time afterwards. B2B content benefits from solid storytelling, if you need some more ideas on how to use storytelling in B2B – check out this look at how the New Yorker gets it right. Want monthly B2B copywriting tips to your inbox? Sign up to our insights email. Storytelling is back on the agenda for content marketers, but how can copywriters adapt storytelling concepts in copy for B2B marketing? Listen to find out.